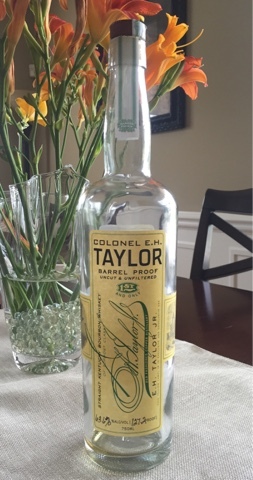 This is one of those bottles that I've known is out there but have rarely seen in the wild (kind of like Elmer T. Lee, Elijah Craig Barrel Proof and Angel's Envy Rye). So, on a drive back to the office one day, while stopping at a couple liquor stores just to see what was there, I looked up and saw about eight bottles of the E.H. Taylor Barrel Proof sitting on the top shelf, and I grabbed one without hesitation. I told the clerk that I'd been looking for a bottle for quite a while and had not seen it anywhere else, and he was surprised, noting that he had no problem getting his shipment. In any event, I was happy to have finally landed a bottle. I found the nose to be incredibly enjoyable, as I was hit with unexpected notes of chocolate and almond, and perhaps a slight hint of cherry. The first sip hit me with the heat, but not enough to take away my enjoyment. Expecting the chocolate and almond that I noticed on the nose, I was surprised to find that on the front end it was instead coffee and caramel (a personal favorite flavor combination of mine). At the back end the oak influence really came through, adding that dry, spiciness to counter the sweet, up-front flavors. I expected more viscosity from this high-proofer, but it actually comes across as a bit watery in texture. However, it was still full of flavor. As I made my way through the bottle, the bourbon became much more oak forward, and it seemed to take on a more peppery spice. The other flavors seemed to transform into a blend of cinnamon and leather, moving away from the sweetness that dominated at first. I really liked this bottle when I first opened it. It had an incredible nose and a great combination of sweet and dry notes. Towards the end of the bottle I found myself wishing for those flavors to return, but, of course, they did not. It was a very good bourbon, and I'm glad I finally got the opportunity to give it a run, but it was not what I would deem a great bottle. I felt it was kind of a tease and found myself yearning for more from this bourbon, that it could have been great, but just didn't realize its potential.